Bruce Kosub focuses his practice on real estate investment, joint venture formation, development and ownership, mergers and acquisitions and commercial financing transactions. He counsels clients on choice of entity, venture agreement terms, asset sales and dispositions, development agreements, leasing, general contract law, easements and restrictive covenants, loan documentation and debt restructurings from both the lender’s and the borrower’s perspectives. Bruce typically represents private equity funds, institutional and specialty lenders, international, national and local companies owning or managing real estate, and private developers and investors. He also has counseled clients on loan documentation, loan workouts, debt restructurings, foreclosures and other collection activities on the lender’s and borrower’s side for several real estate cycles. 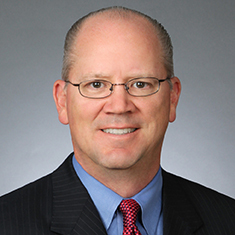 He is on the firm’s legal opinion review committee and maintains offices in both Dallas, Texas, and Washington, DC. While in law school, Bruce served as executive editor of the Texas Law Review, Volume 66. Shown below is a selection of Bruce’s engagements.